Picnic Season is here!!! Whether you are having a picnic this Memorial Day (like our family!!) or at a family reunion or even at Fourth of July, BrylaneHome has all the items to make your picnic great, whether rain or shine! • fill this spacious gazebo with our extremely comfortable outdoor furniture to extend your patio well into your backyard. 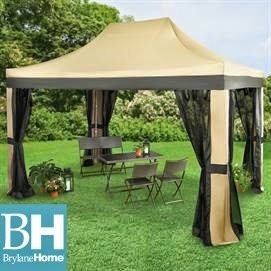 This large outdoor gazebo offers a huge 10' x 15' shaded area perfect for picnics, parties and relaxing. This Gazebo is a great way to take advantage of the sweet smell and feel of the seasons without giving up the comfort of your living room recliner and sofa. It protects from the sun (No SUN BURN!) and I love the nylon netting that keeps out the pesky mosquitoes and flies that can ruin a picnic! It is super easy to set up and is nice and roomy for lots of guests, tables or food! This Gazebo is perfect for family reunions, grad parties, summer picnics, and so much more! This great picnic caddy keeps table clutter free and stores everything you might need for outdoor dining and entertainment! It's easy to carry no matter where you're going. • saves trips back and forth! • great for dining on the patio! This picnic caddy is perfect for holding all of your dining essentials and it's easy to carry. It's the ideal accessory for camping or a trip to the beach and comes at a great price. I love that it holds down napkins that are ALWAYS blowing away in the wind outside and it makes me multiple trips in and out of the house turn into only ONE! Make sure to check out the entire selection of great picnic items from BrylaneHome and 'like' BrylaneHome on Facebook and 'follow' BrylaneHome on Twitter! Buy It: You can purchase both these items from the BrylaneHome website. 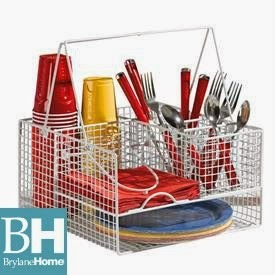 Win It: BrylaneHome is generously offering (1) Picnic Caddy to a lucky winner!